Back at Tasma Terrace at 10pm for a show in a ‘late timeslot’, I entered the theatre to find very welcoming and stunning show performer (and host) Tara Rankine chatting to her audience and making sure everyone was happy and settled. The audience were about to partake in a party – about literally being in Tara’s heart. There were fun ‘party’ aspects to this show – songs, games, activities and inflatables! At times it almost felt like a hen’s party merged with a cabaret show. The songs were often accompanied by live music played by Maddie Thiele (who looked after the music and lyrics) which was a delightful touch. This show is broadly themed on the different kinds of love (especially those that Tara has experienced) – ‘Rockstar’ love, addictive (Heroin) love, and friendship love (among others). These themes were explored through song (Tara has an amazing voice! ), prop comedy and some very interactive hilarious scenes with volunteers from the audience. Yes – this is a show with a good amount of audience participation (plus the inclusion of some sensitive subject matter) – so shrinking violets need not apply! Tara magically draws her audience into her stories, and invites the audience into her heart throughout the show. It would be difficult not to be moved by “Love is a Work in Progress” – there were times when I was captivated, and at other times I could feel my eyes becoming moist. Big love and big emotions aplenty. It really feels like Tara pours her heart out for her audience, and her audience returned the feels just as much. Having a theatrical background meant that Tara was often (literally) reaching out to audience members, and I loved seeing so much emotion in her eyes that unwavered throughout the show. I could see Tara’s heart shine through her songs and eyes during “Love is a Work in Progress” which made it a special experience. Like the subject matter, this show is more than just a title – it is quite an experience! If it reads like I’m gushing, then I encourage you to see the show as you’ll find out why! The show ended on a very pleasant note, with Tara receiving a partial standing ovation – rare for comedy shows and much deserved in this case. I walked away thinking “Gosh, what a room full of love!” There are some powerful stories within the show – and I must admit the day after seeing the show, much of the emotions and story content occupy my mind. Not many shows I’ve seen have had such strong staying power. Testament to the fun time that I had, I am tempted to see the show again – so I encourage all of you to come and see the show before it leaves town! It will be a show you won’t forget in a hurry. VERDICT: This is a show that will stay with you – in your mind and heart. 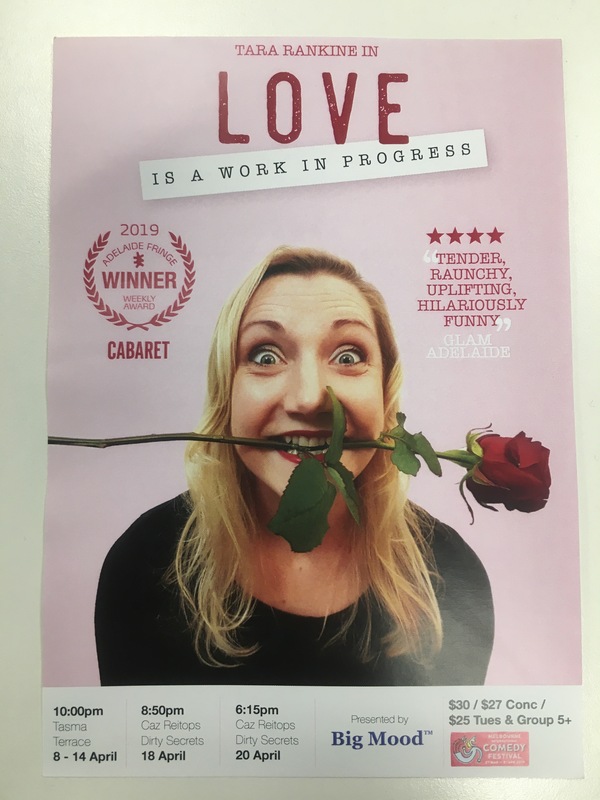 Featuring a powerful performer addressing some serious subject matter at times, “Love is a Work in Progress” manages to be entertaining, hilarious and meaningful in equal measures – who could ask for more? *Disclaimer: I attended the performance as a guest of the show.